The Okavango Delta is a place of numerous eco-systems and as such provides something for everybody at any time of the year. 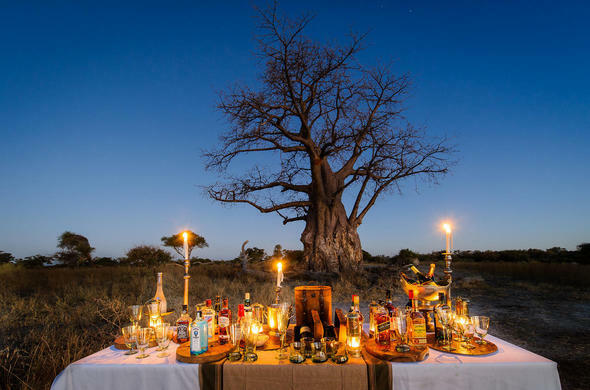 Read more on the best time to visit the Okavango. The dry season is generally considered the best time to travel to the Okavango as this is when the water levels are at their highest. This strange phenomenon occurs as most of the water in the Okavango ecosystem comes from the highlands of Angola. The Angola Highlands are situated almost 2000 km from the Okavango and the waters take 4 to 6 months to reach the Okavango system, arriving in the Delta months after the last rains have fallen. By the time the waters arrive the area has become dry leading to a unique situation of a Delta in the desert. The seasons of the Okavango have been discussed at great length but in brief there is a rainy season and a dry season, which happens to be the season of highest water levels. The rainy season is a time when many animals give birth and the land is covered in a lush green carpet of vegetation. The dry season in the Okavango is a fascinating time, a time of dust and flood, a time when animals concentrate around the permanent waters. It is a time when the floodplains provide nutritious grazing for the animals that have struggled to find food in the Bush. It cannot be said with certainty what is the best time to visit the Okavango Delta for wildlife viewing, as each season has its highlights. The rainy season is a time when the herds gather together and give birth and the predators find easy prey in the young animals. The dry season is often thought of as the best time to view wildlife, and although this can be true in some places in the Okavango, it is not necessarily true for others. The best time to visit the Okavango for birding is during the summer months when all the migrant species have arrived and when many birds have congregated to breed. However, during the dry season when the flood first arrives on the floodplains birding can be dramatic, as birds flock to feast on the creatures that the flood throws up. There is also a time during the dry season before the arrival of the floodwaters, when the floodplains are drying up into small pools, when hundreds of birds of numerous species congregate at the drying pools to feast on the fish and crustaceans that are trapped. The best time to visit the Okavango Delta for activities is probably the dry months when the water levels of the Delta are at their highest and the water activities are at the peak.